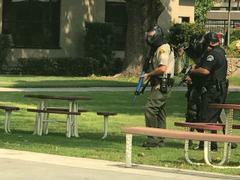 Yesterday, LASD Cerritos and Norwalk Stations participated in an Active Shooter Training exercise that took place in Cerritos at Valley Christian High School. 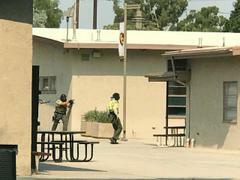 Los Angeles County Sheriff’s Department (LASD) and additional law enforcement and fire agencies conducted an Active Shooter Drill, focusing on four key areas: Prevention, Intervention, Rescue, and Family Reunification. 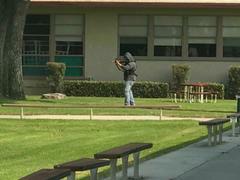 This rapid response training simulated an active shooter at Valley Christian High School in Cerritos. The training included LASD deputies from Cerritos and Norwalk Stations, as well as Metropolitan State Hospital Police Department, Cerritos College Police Department, and Los Angeles County Fire. Deputies and officers were given a scenario and instructions by deputies from the Sheriff’s Department’s Tactics and Survival Unit. The deputies and officers entered the campus and brought the situation to a safe resolution. While the scenario was being conducted, rescue personnel entered the campus and rescued the “injured” and conducted force protection training along members of their rescue task force. As part of LASD’s ongoing commitment to saving lives, where every second counts, active shooter drills like these sharpen the skills necessary to quickly neutralize the threat and allow for quicker medical response.